Eminem may have another Joe Budden diss track on the way. 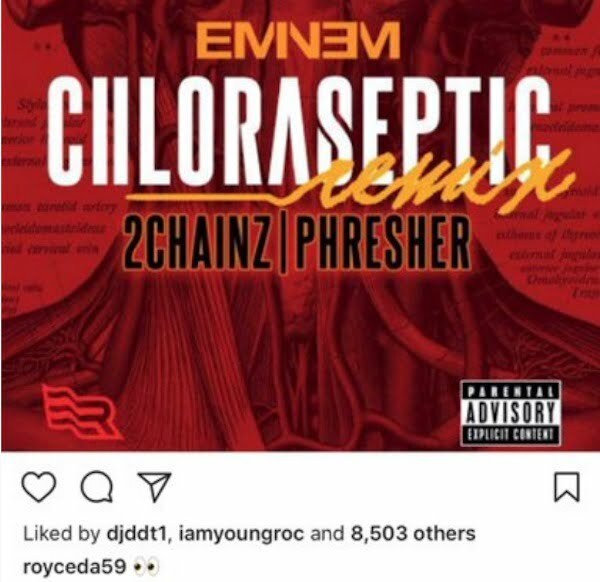 Last week, Eminem surprised the rap community with his “Chloraseptic (Remix)” with 2 Chainz and Phresher where he took a few shots at his Slaughterhouse comrade Joe Budden. A lot of us may say that the rapper turn podcaster cause this on himself when he called Eminem’s new album Revival trash. Likewise, a lot of us really think that the album is trash but still feels the need to protect Shady from certain critics like Budden who has never been shy about speaking his mind on any topic in hip hop. Nevertheless, Eminem fired back without calling his name on the track and Joe Budden has since come out saying he doesn’t think that he was the one Em was dissing. Sources are now saying Em has another diss track coming and this time he will go directly after the “Pump It Up” rapper. “I think he (Eminem) feel some type of way about being targeted by someone he is close to as if there were some bad blood between them,” sources said. D2 member Bizarre was one of the first to push back at Joe Budden on Twitter by calling him a traitor. “Never bite the hand feed u.. I never like to do anyway chump,” Bizarre tweeted. In case your wondering about the history between Joe Budden and Eminem here is a quick rundown. Budden was a member of Slaughterhouse, with three other rappers, Royce da 5’9″, Crooked I, and Joell Ortiz. Em signed the group to his Shady Records in January 2011. Over the years, Budden has been a strong ally of Eminem until his harsh criticism of the Detroit rapper’s new album. So when Bizarre says never bite the hands that feed you, that is what he was referring to. Joe himself is no pushover when it comes to battle rap, remember his attack on Drake two years ago. But when it comes to raw battle rap, Eminem is one of the greatest of all-time, so it will be interesting to see if he responds to Shady. YFN Lucci and Offset showcase their lavish lifestyle in “Boss Life” video. The Michael Garcia-directed visuals comes exactly a month after YFN debut the Offset collaborative single. The song features the two rappers trading bars about their expensive taste in jewelry, fashion, and women. A portion of the visuals match the current brutally cold winter season but the smoking hot ladies don’t seems to mind taking it all off. Aside from falling snowflakes and gorgeous women, the duo show off their expensive diamond jewelries to match the theme of the song. In another scene a female lay on her back on a table with sushi covered her body. The single “Boss Life” will appear on YFN Lucci’s upcoming album Ray Ray From Summerhill, due this year. He also debut a new single with Meek Mill, “Street Kings” last weekend that will also make it to the project. Offset is currently getting ready to drop his next Migos album Culture 2 in two weeks. The project will be the follow up to the group’s critically acclaimed first installment released a year ago. The group had a big year last year both as a group and their individual solo careers. Quavo was feature on almost every collaborative single and was one of the most streamed artists on Spotify. Future and Zaytoven hints at a possible Beast Mode 2 coming soon. The producer uploaded a photo of himself and the Atlanta rapper on IG on Monday with the caption being peace sign emoji. Some fans took it as a confirmation that Beast Mode 2 is coming soon. This month marks three years since they dropped the first installment in the mixtape series. While neither gave any concrete confirmation, they drop enough hint to fuel rumors that the project is on the way and could arrive as early as this week. During an interview last year, Zaytoven spoke about working on the follow up project with Future while alluding to the rapper’s busy schedule as part of the reason why fans have not gotten the second installment in the mixtape series. He also spoke about the chemistry in the studio between the two saying that the project left a hunger for them to continue working together. Last year alone Future released three projects which is a bit of the norm for the “Mask Off” rapper, so you can expect a ton of new music from him this year and hopefully that will start with Beast Mode 2. Zaytoven and Future will make a cameo in the upcoming Sony film Superfly. They were both spotted on set recently with Director X, who is directing the movie starred by Jason Mitchell and Trevor Jackson. 21 Savage was also spotted on the set and the Freebandz emcee is task with producing the soundtrack.